I don't feel entirely pleased with myself for having made this project, because Dolores really doesn't need any more clothes at this point. Making excess stuff just because I fancy it really doesn't square well with my attempts to sew more sustainably. But let's gloss over that for the time being, shall we?! As I've mentioned previously, back in 2013, when I was pregnant with Dolores, I received a year's subscription to Ottobre Design magazine from my mum. I know that kids clothes aren't subject to quite the rapid turnover of trends that women's wear is, but I think it goes to show how well designed Ottobre kid's patterns are in that somehow they manage to look neither dated nor 'traditional'. 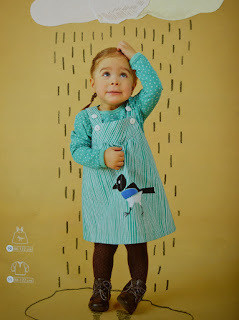 This little pinafore pattern came from the Autumn 4/2014 edition. The sizing for this pattern runs from 86cm to 122cm. 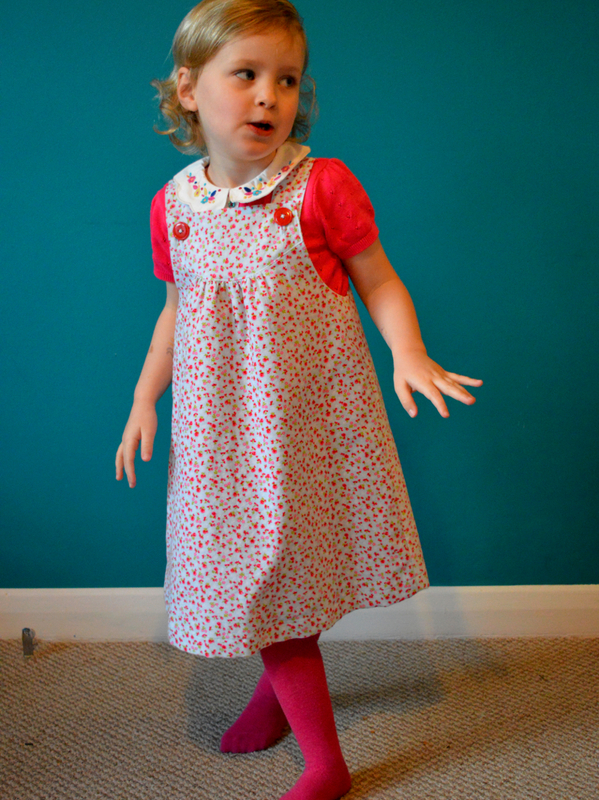 For Dolores, I traced the 104cm width and 116cm (ish) length to make this dress last a couple of years. I also added a sizeable hem allowance so it could be let down if necessary, although that may have been overkill. I love the gentle gathers into the front and back yokes. 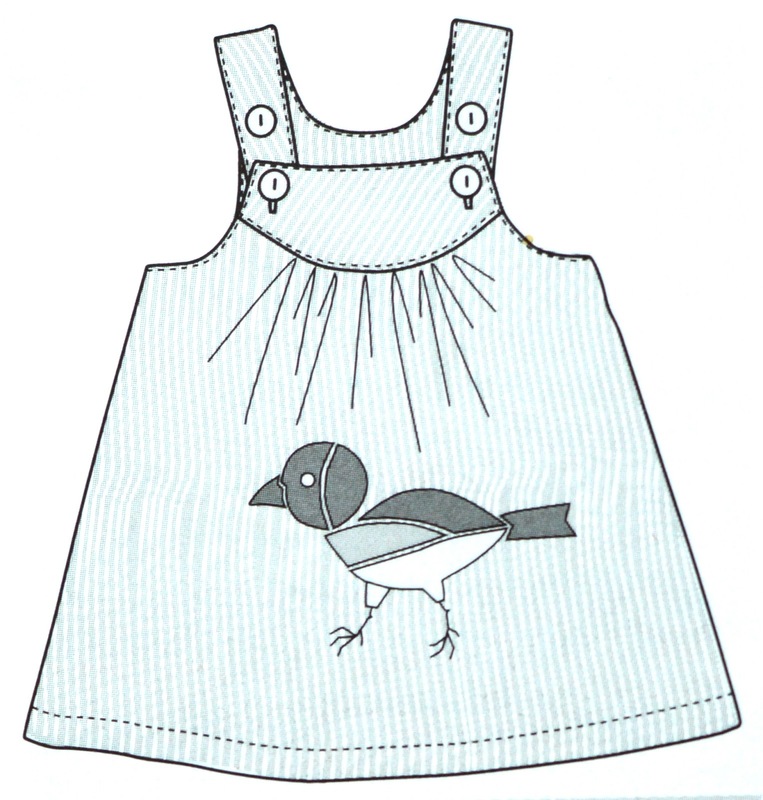 As you can see, I omitted the unnecessary magpie applique (! ), but it'd probably look sweet with some patch pockets. The only criticism I have of the pattern is that the straps are crazy-long. 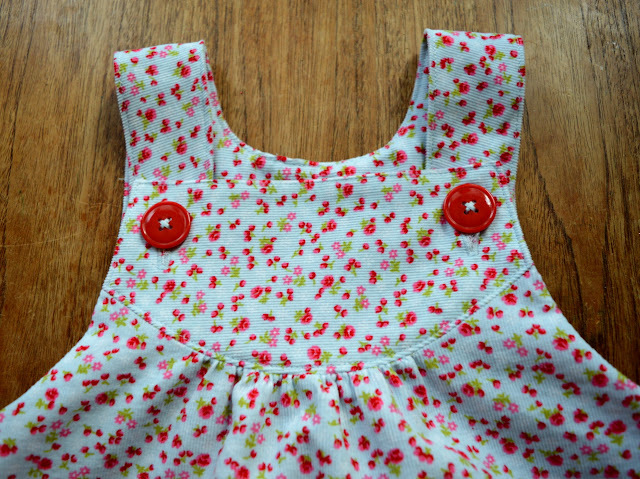 However, if I keep repositioning the buttons down the straps as she grows, she may still be able to wear this when she's ten! This ditsy floral needlecord was another score from my friend Kerrie's recent de-stash (as mentioned in this post). Weirdly enough, I'm finding it easier to work through Kerrie's stash than my own! There was just enough to squeeze out this pinafore, and it's lined in some fuchsia poly-taffeta from my stash. In hindsight, I'm not sure it was an ideal lining choice, as I'm pretty sure the skirt part looks a slightly different shade from the yokes, which I self-faced. But I'm probably being over-picky. That's a ridiculous title for a blog post, of course. I haven't worked out a way to stretch or exist outside the regular parameters of time. However, despite being a SAHM to two young children and a part time sewing teacher, at the moment I'm managing to find a surprising amount of time to sew. 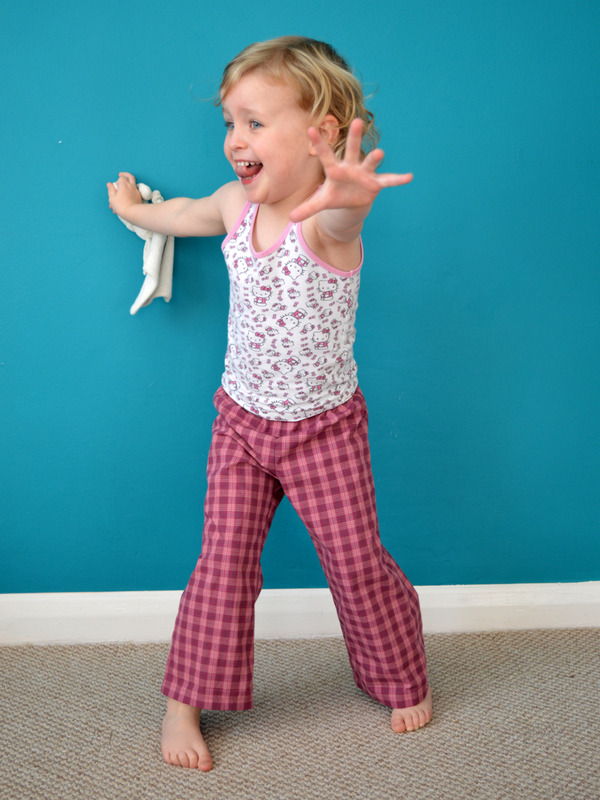 I talked about the 'why' in my Ease Into Motherhood post last July, and today I want to write a little bit about 'how'. When Dolores (who is now four) was a tiny baby, I went through a horrible, but thankfully brief, period of thinking that I should spend any time that she was asleep doing things that were related to her care. Once I'd got her down for a nap, I'd take care of my own basic needs and then I'd get started on the laundry, washing up, etc. until she woke up. I guess I felt that that was what a Good Mum was meant to do. I planned to have my 'me time' (to sew, read blogs and write my own) in the evening once she was down for the night. But in reality, I was always too tired and would end up watching TV feeling frustrated. Let me tell you that this formula is the road to depression and resentment. It took me a while, but I finally learnt that being a martyr to your child is not being a Good Mum; it doesn't best serve yourself or your family. I was lucky that as an older baby and little toddler, Dolores use to have sizeable and consistent naps, so I was able to get quite a bit of sewing done during those couple of years. When she dropped napping altogether, sewing had to be relegated back to an evening-only activity. But it was such a deliciously solitary thing to do after each full-on day of toddler-wrangling, that my depth of desire to sew, if only for half an hour each evening, helped me overcome the tiredness that might have stopped me doing any at all. When I was pregnant with Frankie, I had a word with myself to make sure I wouldn't fall into the martyr-mum role again. I knew that caring for a newborn and a 3yo at the same time was going to be a whole new level of challenging, and that carving out tiny pockets of time to sew was going to be essential if I was going to get through it without my mental health laying in tatters by the time we reached Frankie's first birthday. To avoid the aforementioned frustration and resentment, I kept my aims really low. Like, 10 minutes a day low, for the first few months. And soon I found that I could complete one step of a project (like sticking a PDF together, or inserting the sleeves) per day. Time spent sitting underneath a feeding or snoozing baby, particularly when the big one was at nursery, gave me lots of time to think about each step, so when I did get the micro-opportunity to escape to my sewing corner, I could get stuck in straight away and be pretty productive. (And the next day I turn my back for a minute and he's now actually ON the sewing table. The problem was, as he left the newborn stage, Frankie failed to fall into the lovely and reliable nap routine that Dolores had. His naps have been inconsistent and often quite short. So what to do? I found that if I spent however long his nap would be only sewing, then I'd find I had a massive amount of chores to do after he woke up with him all cranky because I wasn't giving him the attention he craved. But if I spent his scant naps only washing up and tidying, then enter our old friends frustration and resentment. So I've found what works best for me is to flit between roles and tasks. For example: Frankie goes down for a nap, then I put the laundry on, then I do a bit of sewing, then I start the washing up, then I do a bit of sewing, then I finish the washing up, then I do a bit of sewing, then I tidy up a bit, then I do a bit of sewing, and so on until he wakes up. That might sound insane and exhausting, but it's genuinely the only way I've found I can make the most of however long he's going to stay asleep. Confession time: if Dolores isn't in nursery, I let her watch TV whilst Frankie takes his nap. Whatever your thoughts are on TV, I prefer her to not watch too much. But I've overcome my guilt of allowing her to see 1-2 hours a day because she's full-on, active and engaged the whole rest of the day. Of course, this is only working for me because I have long since let go of being used to the great swathes of sewing time that I used to have before kids. I feel that the newborn phase of parenthood, where somedays getting to wash your hair can be an unobtainable luxury, does the job of making you feel grateful for the odd 10 minutes sewing time when you can grab it. And when 10 minutes of sewing expands in to an hour or two, that can feel like days! But it is definitely worth reminding myself/ourselves that this early, super-dependant stage of childhood is very short lived. Can you believe I've just filled in Dolores's schools application?! Longer spells of sewing time will be with me again, I just hope I'll stay this productive! What about you? Have you found any seemingly-bizarre ways to fit sewing in around a busy life (with or without kids)? Are you one of urban legends, for example, that set your alarm early to get some sewing done before work or the rest of your family wakes up?! Any tips you can share on what works for you? Usually, what's currently 'on trend' in clothes shops is of very little interest to me, and has next to no influence on what I want to sew. But occasionally a style/look/detail comes along that really chimes with me. And right now, I'm ALL about the ruffles. 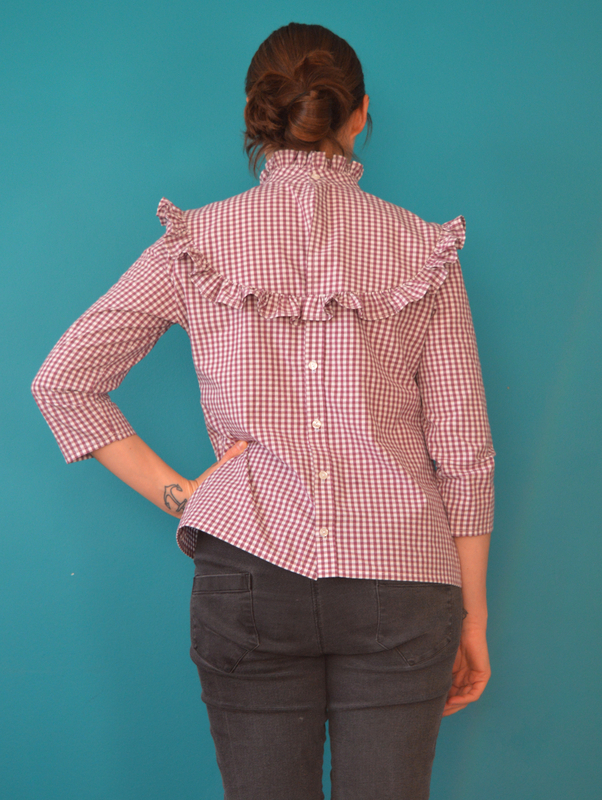 I discovered Nina Lee's Bloomsbury blouse pattern via Pinterest, and it was kind of love at first sight. 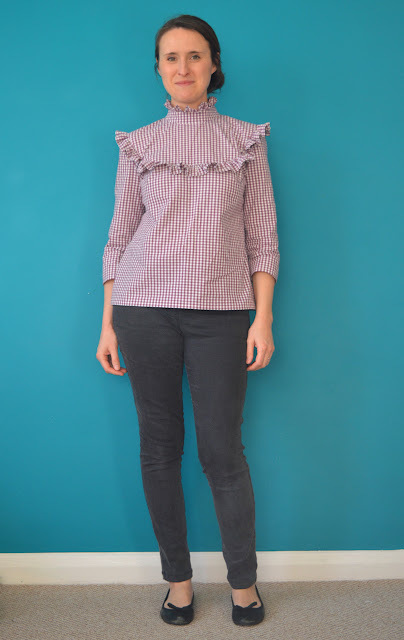 I had a similar blouse when I was at university, with the pie-crust collar but sleeve-less I think. 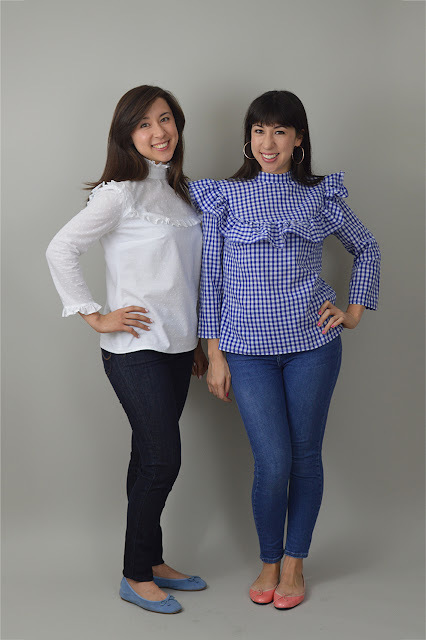 I rarely buy printed sewing patterns these days, but when I saw Nina's stall at last year's GBSB Live event, I took the opportunity to buy it directly from her. Let it be known, she and her sister (pictured below) are the sweetest ladies you could meet IRL! Back to the pattern. 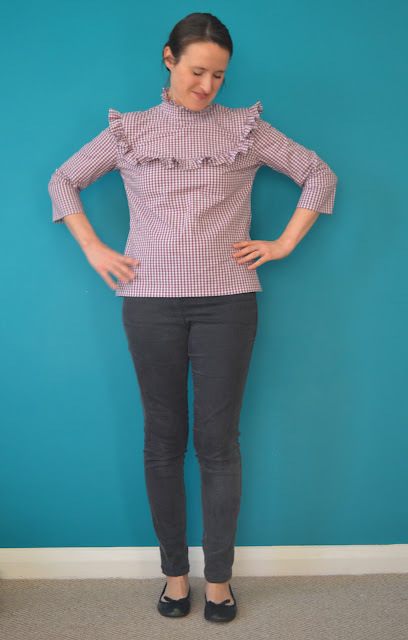 This blouse has some options to choose from: a dramatically wide or more modest yoke ruffle (I split the difference and went for something in between the two widths), and optional neck and sleeve ruffles. 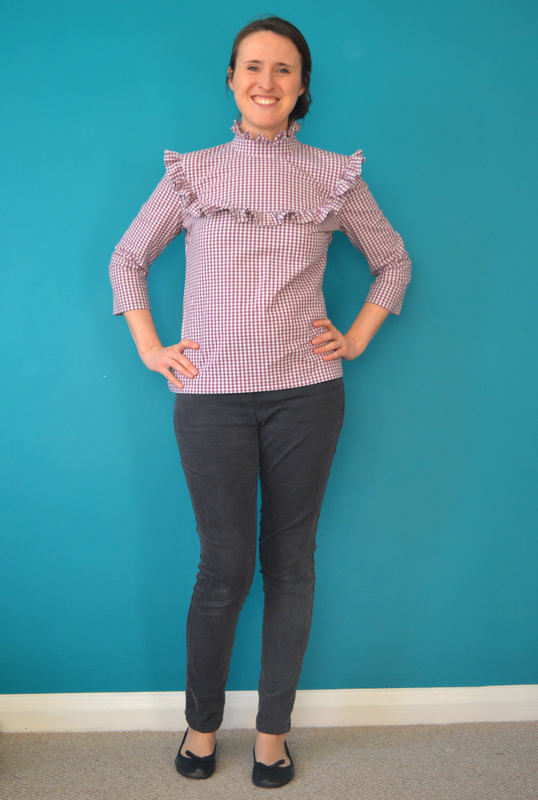 I decided to go for the neck ruffle in homage to my university blouse that I doubt I wore as often as I should have, but my limited fabric ruled out the sleeve ruffles as well. I'd like to try the sleeve ruffles on a potential next version, however I would be a little concerned that they may make it difficult to wear a cardigan over the top. Anyway, you could have a lot of fun mix-and-matching the design elements, plus I think Nina has made a sleeveless version which could be great for hotter weather. I started making this blouse during the time my overlocker was out of action, and I worked on it in small instalments alongside a bunch of other projects, so it's difficult for me to judge exactly how long this project took from start to finish. However, even if this was the only thing on your sewing table, it would be a relatively time-consuming make. Prepping, hemming, gathering, pinning and stitching all those ruffles takes time, so I'd recommend sewing this pattern when you're not in a rush for something new to wear. Usually I'd trace a sewing pattern first instead of cutting straight into a printed one. Yet this time I was feeling bold, so after measuring the pattern pieces against other, well-fitting blouse patterns I own, I felt confident to cut the size 10 around the shoulders and bust, blending to a size 12 for the waist and hips, plus folding out 2cm below the bust to account for my short-waistedness (my standard pattern alterations). I think the fit in general was spot on, however I made a couple of small changes after checking the fit mid-way. Firstly, I restitched the sleeve seam to allow a bit more width around the elbow and sleeve hem. Secondly, I reworked the side seams as I found the angle of the original waist shaping too extreme and the seam allowance couldn't lay properly. My friend Kerrie (hi Kerrie!) recently had a MAJOR destash; her job and post-grad course take up so much of her time that she has little opportunity to sew these days. I was a grateful recipient of a sizeable chunk of her stash, including this plum/off-white cotton gingham. Initially, I considered using it to make a shirt for Pat, but men's work shirts are so easily found in charity shops that I decided not to bother, and in fact managed to thrift him a gingham work shirt shortly after making myself this blouse. When I first put this blouse on, I questioned the wisdom of including the neck ruffle, and foresaw some unpicking and removal. In the end, I decided to keep it, but if I were to make it again, I'd possibly alter the proportions slightly by making the neck stand narrower. 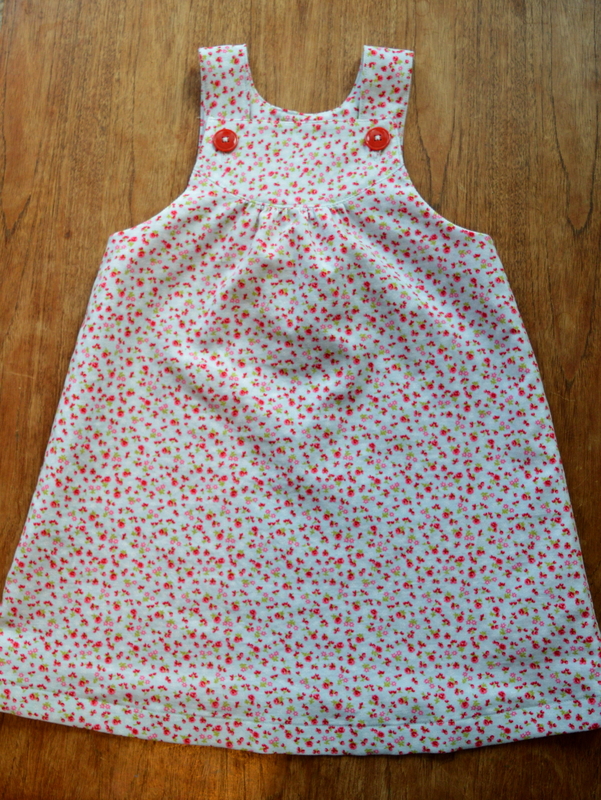 Plus, if I were to make this pattern again, I'd change the back yoke pieces so I could add buttons all the way up. As you can see from the back photo above, the open section of the centre back doesn't lay flat, which is a shame as I think it's a lovely design detail. But these are all little niggles, in general I'm super happy with this blouse. I wouldn't have chosen this colour fabric as it's not one of 'my colours' but I'm so glad that stash-busting forced me to try something different and add a new shade to my clothing selection. I'm often inspired to sew for the opposite season that I'm currently experiencing. Therefore I found myself sewing a stack of summer shorts in November. 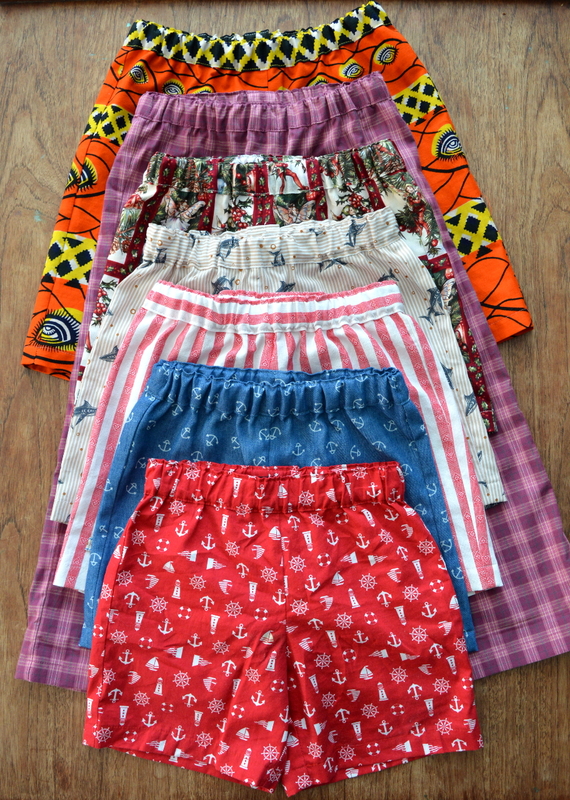 And having made seven pairs now, I feel I have tested this pattern pretty thoroughly! 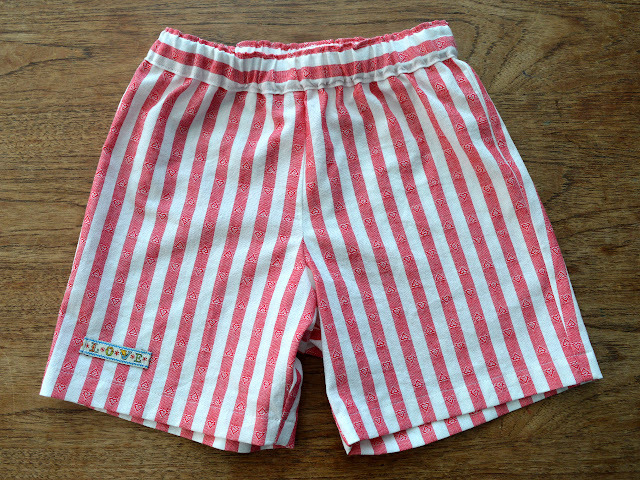 This basic shorts pattern by Oliver + S is a fantastic staple for summer, and for sleep wear. 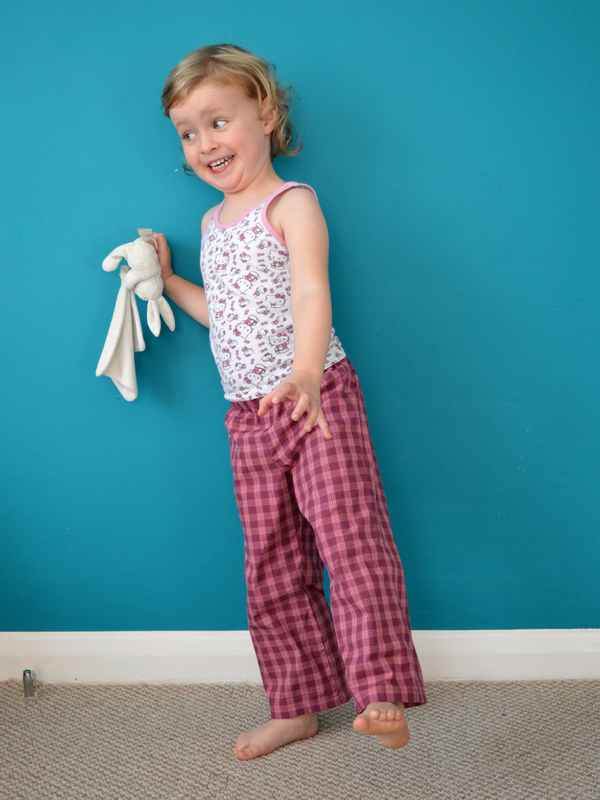 The pattern consists of three pieces: front, back and waistband, and is an excellent stash buster, plus a blank canvas for customisation. 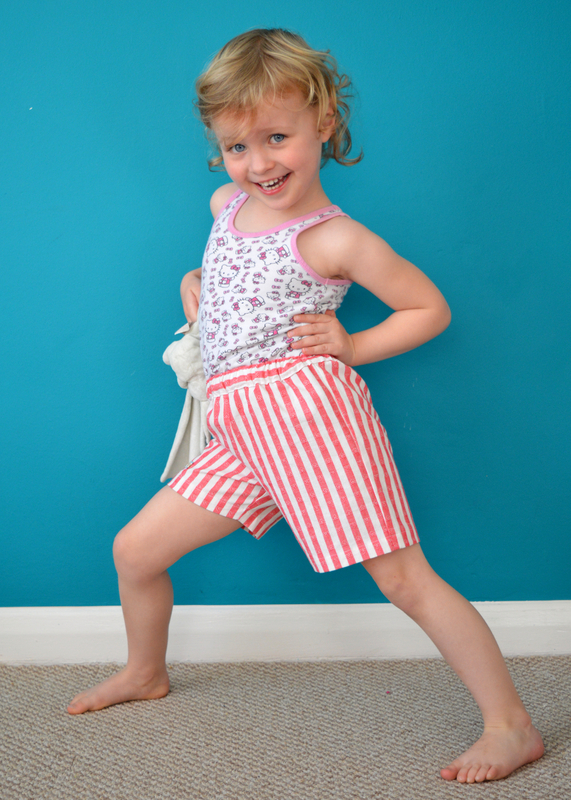 The pattern PDFs have been grouped into two sizing sets: 6m to 4 years, and 5 to 12 years. However, please be warned that this pattern comes up pretty small. 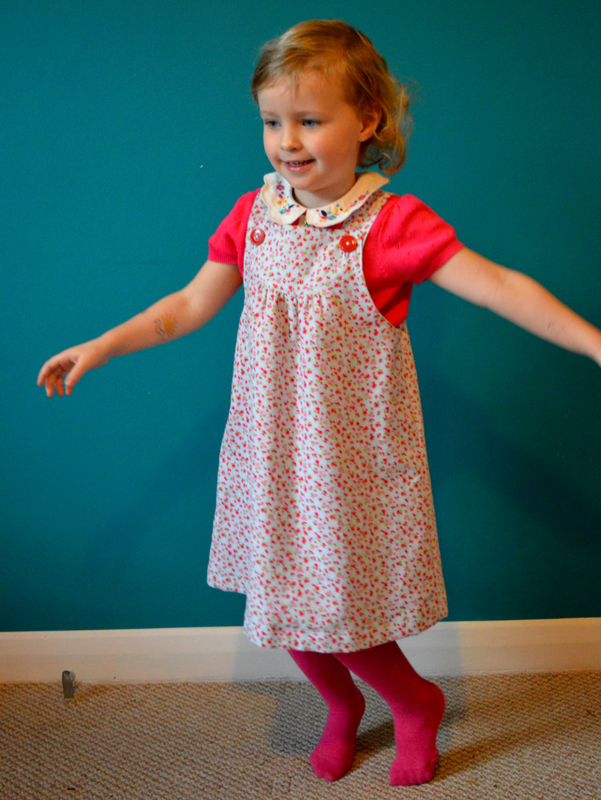 Dolores has just turned four, and here she is wearing size 5. Frankie has just turned one, and in the picture above he's wearing size 3 (he'll be around 18 months when it'll be hot enough for him to wear these outside). The African wax fabric pair were made for a friend's son's fourth birthday, but he's big for his age, so I made him size 7 just to be on the safe side. I'd recommend erring on the side of caution and making at least one size larger (unless the child you're making them for is little for their age). If you take an accurate waist measurement when cutting the elastic then they won't fall down, and you may be able to let out the elastic and get another season's wear from them. 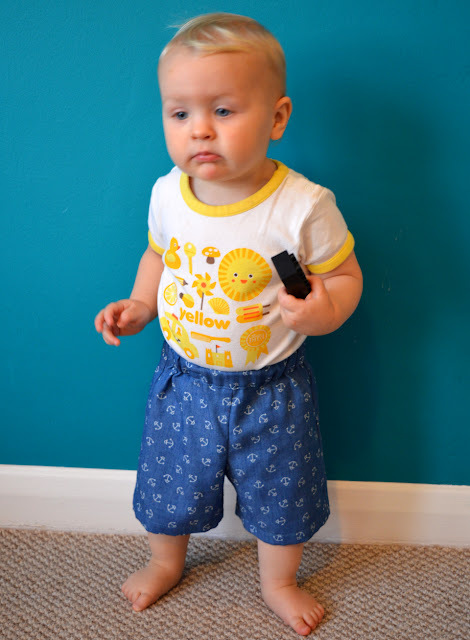 I always cut waist elastic 4cm shorter than the child's waist measurement, plus 2cm for an overlap which gives a bit of wriggle room if they need to be let out. As mentioned above, this basic pattern can be a great stash buster. The main reason I made so many pairs to test this pattern was because I kept finding small lengths of light or medium cotton in my stash. 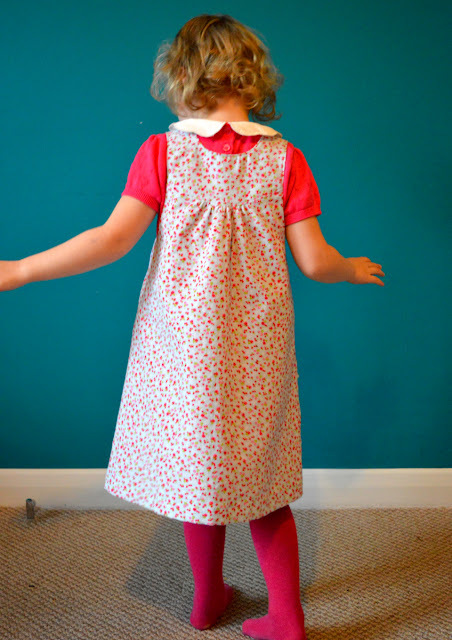 Plus, this is one of the rare sewing patterns that seem to work well in quilting cotton. 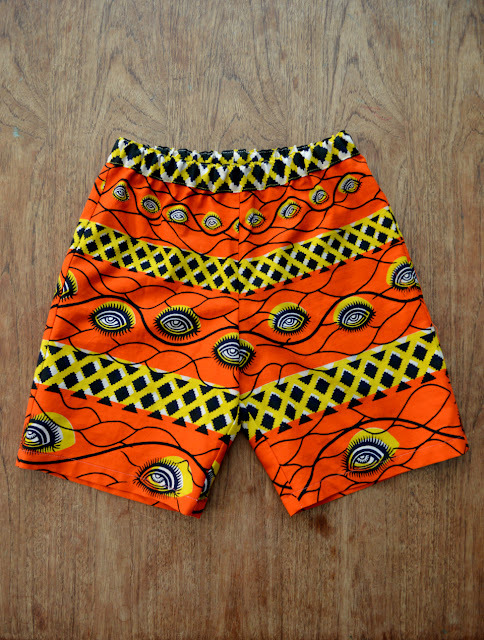 The waistband could be made from a contrasting scrap of fabric if you wanted to use up even smaller pieces. I have also seen people on instagram use this pattern in stable knit. 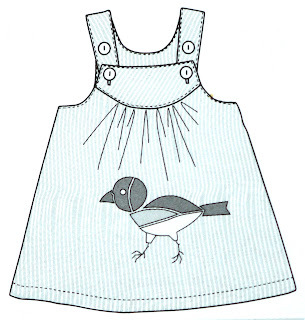 Oliver + S always produce excellent sewing patterns, and the instructions are clear and easy to follow with great step-by-step diagrams. This is a good pattern for beginner sewers/sewists to get their teeth into, and others will enjoy a quick project with a slightly-less-common waistband/elastic casing method. 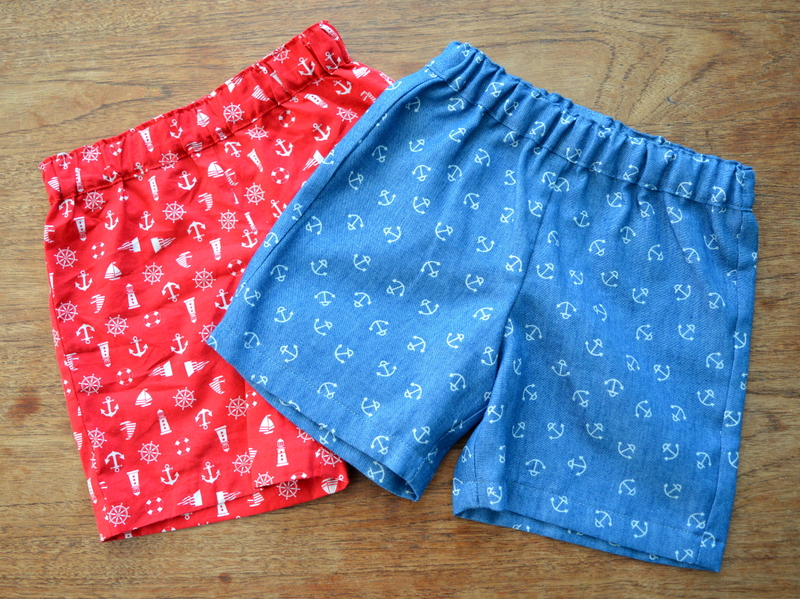 As for the finished garments themselves, here's where I reveal some entrenched gender bias that I'm not particularly proud of, but I kind of feel that the silhouette works better for boys than girls as daytime shorts. I'm totally going to let Dolores choose when she wears hers without steering her either way, but I'm kind of expecting her to use them (the stripy, fairy print and sharks print ones, and more obviously the plum check ones) as summer pyjama bottoms. Most definitely! 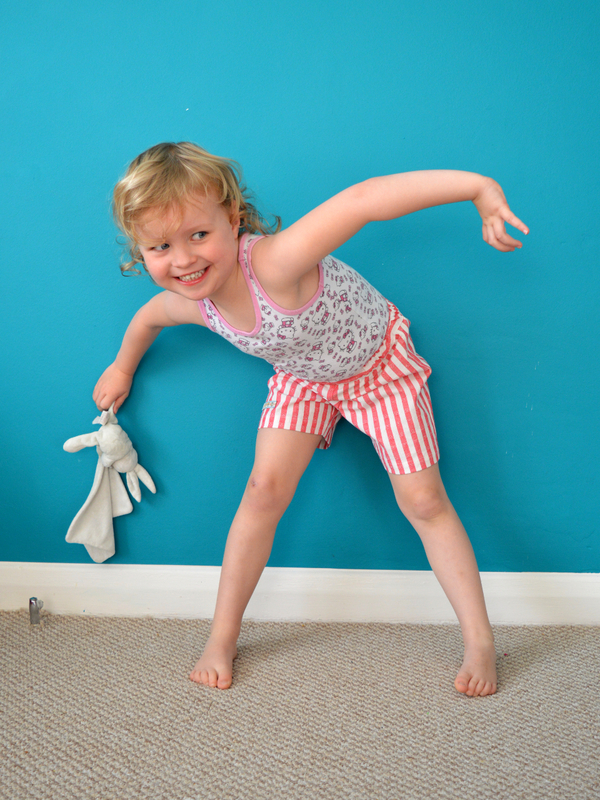 It's great to have a pattern on hand to help turn random half-metres of cotton fabric into useful, wearable kid's clothes.